Sphinx Wild is an IGT based online slot game of 5 reels and 40 paylines. Total coins for this slot is 40, while coin sizes for Sphinx Wild slot ranges from 40p to €400 per spin. You can play this slot at devices like desktop, tablets as well as on mobile phones. The game offers a jackpot of 1,000 times of your total bet and there are 2 bonus rounds available in this game. You can receive 7 to 600 free spins in this slot machine plus 1 to up to 5x of multiplier. 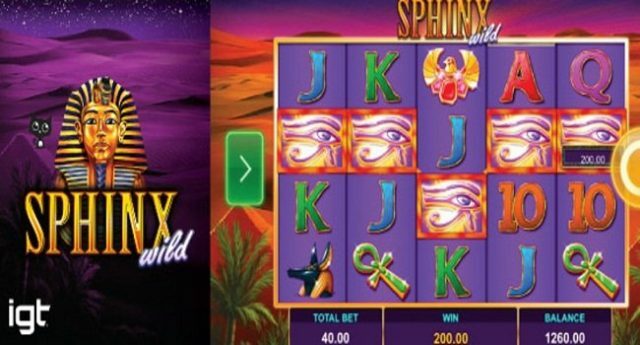 Sphinx Wild video slot is based on ancient Egyptian theme, where a player needs to explore the hidden treasure. This is a very interesting and adventurous slot game from the makers of IFT software. Play Sphinx Wild slot at any IGT casino for free or for real money. This slot contains symbols like A, k, Q, J and 10 playing cards. The reels of this slot are being set against a background of pyramids at sunset. The Sphinx Wild is the wild symbol in this game and it is the most lucrative symbol which will give you 25 times of your total bet if you landing 5 of these symbols across a payline. This wild symbol can replace all other symbols except the scatter symbol which is the pyramid. There are many advantageous of playing this slot at mobile or smart phones. The free spin feature can be triggered if you land 3 or more of the scatter symbols anywhere on the reels. 3 scatter will pay you 3 times of your total bet,4 scatters will pay you 10 times of your total stake and 5 scatter symbols across the payline will pay you 25 times of your total stake. On another way, if you land on 3 scatters it will give you 7 free spins plus a multiplier of 5x, 10 free spins will give you 3x multiplier and 15 free spins wil offer you 2x multiplier. You can receive up to a whooping 600 free spins, while playing this slot and by retriggering the free spins.